"Definitely not your ordinary cowboys and vampires." LonePine, Wyoming; population 438, that's where Tucker, a typical cowboy and his faithful dog, Rex live. Lizzie Vaughn, a NYC journalist is doing a story on cowboys and goes to LonePine where she encounters Tucker; she decides he's the right cowboy for her feature story. He's not terribly interested, but she insists. As they get to know each other better, they find they are much alike. They become rather fond of each other, and eventually lovers, but she lives in New York; it's a long-distance relationship that works, even though they miss each other more than they thought. After her successful cowboy story, Lizzie is asked to do one on the vampire culture in New York. She opts for one that looks a bit more civilised than some others. It's more of an art gallery, where she meet Julius, a distinguished older man who is rather fascinating ... and glamourous ... At that soir�e, she sees things that scare the daylights out of her and she decides to pay Tucker an impromptu visit to get her head together. And that's where everything goes really wrong. Or really right for us, readers. The authors have managed to blend traditional cowboy clich�s with a truly gothic, yet modern, vampire atmosphere. The have added unusual twists to the vampire mythology, such as the references to a vampire Bible. The authors are extremely gifted writers; the dialogue is brilliant: all the characters have their own speech patterns, accents, their very own voice; they all sound as unique as they are. THE COWBOY AND THE VAMPIRE wonderfully colourful, very funny sometimes, suspenseful, and wildly entertaining. The world-building is meticulously crafted and detailed, the characters live on the page, the action never stops and there is a sweet love story. There is a bit of a cliff- hanger at the end, and a most delightful ending it is, but I did not mind one bit, quite the opposite. THE COWBOY AND THE VAMPIRE is the first book of a series and a total delight. A bloody good read. 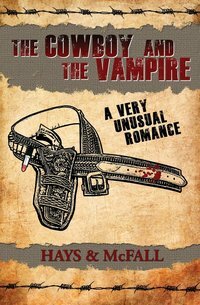 First published in 1999 and now re-released in its third printing, the definitive "author's cut," The Cowboy and the Vampire: A Very Unusual Romance is the first book of The Cowboy and the Vampire Collection. It's been called everything from a cult classic to a trailblazer in a new genre: Western Gothic. Welcome to LonePine, Wyoming, population 438, where the best of the west faces off against the rise of the undead. It's a love story for the ages when a broke cowboy and a glamorous big city reporter fall lipstick over boot heels in love. But she carries a 2000-year-old secret in her veins that will test their unusual romance to the very edge of death, and beyond. Saddle up for a hilarious, existential ride through the dying American west with an army of ancient bloodsuckers in hot pursuit. Re: Definitely not your ordinary cowboys and vampires. Thanks for the great and thoughtful review! We're glad the book resonated with you so grandly. The action, humor and romance only intensify in books two and three, so we sure hope you check them out as well. Happy trails!